To recognize the importance of mental health promotion for students and staff, the school board Conseil des écoles catholiques du Centre-Est (CECCE) developed a community-wide strategy called Caring at the Heart of our Actions: CECCE’s Strategy for Mental Health and Well-Being. The board took advantage of Bell Let’s Talk Day on January 31, 2018 to get the conversation started and to share strategies and resources for taking care of our mental health. A collaborative team of staff from Human Resources, Workplace Health and Safety, Learning Support, Health and Well-being, and Communications worked developed a comprehensive plan to reach board and school staff, students, and the community. A group of CECCE staff and students helped produce a video about the importance of taking care of one’s mental health. The Communications team worked tirelessly to publicize the video! During the two weeks leading up to Bell Let’s Talk Day, clips from the video and photos of the video participants appeared on social media. The entire video was then posted on January 31. The video reached a total of 20,000 people and was viewed more than 8,200 times on social media! On the same day, the video was also sent out via email to all CECCE parents, staff members, and middle/secondary school students. School principals shared the video and encouraged its in-school viewing, while seizing the opportunity to promote ways to foster dialogue on mental health and well-being. 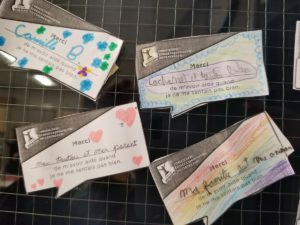 At the elementary level, schools received a card template to print and share with students, who wrote a thank you note to someone who helped them when they were not feeling well. In secondary schools, students and staff were encouraged to plan four “texting/social media breaks” throughout the day. During those breaks, students could share the video, say thank you to people who had helped them during difficult times, and send positive messages using the hashtags #BellLetsTalk and #CECCETalk. Students were more than happy to have permission to use their cellphones during the school day! The Communications team created stickers to remind people which hashtags to use, and invited secondary school staff to wear those stickers for the day. Overall, embracing this day of awareness gave the entire CECCE community an opportunity to begin an important conversation on mental well-being that will continue all year.